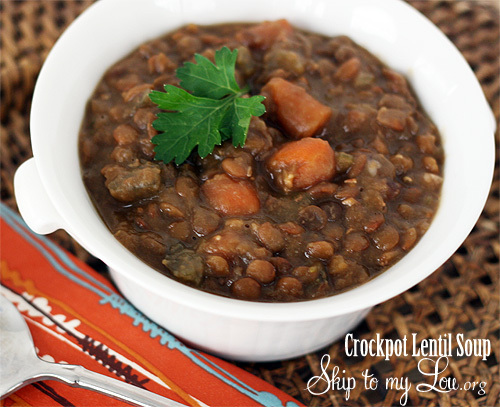 This crock pot lentil soup might not be pretty but it is pretty dang delicious. It is one of my go to soups. It is easy to throw together and when we get home we have a really hearty meal. Lentils are a powerhouse of nutrition. One cup of cooked lentils has 16 grams of fiber and 18 grams of protein. They are also packed with potassium, calcium, zinc, niacin and vitamin K, folate and iron. Another great thing is that this legume is one of the simplest to prepare since they don’t require a lengthy soaking time like other beans. Mix all ingredients in a 4 – 6 quart crock pot. Cover and cook on low for 8-9 hours or until lentils are tender. Before serving, remove ham shanks from the crock pot. Remove meat and discard the bones and skin. Stir ham into the soup. Any ideas for a substitute for the ham shank? I'm wondering if bacon would work. Thanks!